On October 19, demonstrations were held in different countries of Latin America to protest against femicide and violence against women. In San Cristobal de Las Casas, Chiapas, the event brought together about 200 people. The call for a women’s strike was spread regionally, promoted by networks encouraging the taking of public spaces in marches or demonstrations involving men and women. In the demonstration in Naucalpan, Mexico State, women participating in the event were suppressed: according to Radio Zapote, a municipal police patrol car arrived at the town hall, where two uniformed policemen got out and arrested two women who were demonstrating against sexist violence at gunpoint. The CNI and the EZLN have been talking to each other a lot. In the midst of war, as part of the general campaign of dispossession, they have also taken from us the word, the words. And that’s how they want to bury Tlatlaya or Ayotzinapa or make the No win in Colombia. Words are doors and windows of our perception; the words that we use depend on our experience in the world. And it’s that which is immediately threatened and it affects our ability to speak… and to know what happens. Instead of being an autonomous form of relationship, language is being converted into a device for isolation and an instrument of manipulation and control. The field of language is as rich and varied as nature… but the war that is unleashed against it makes linguistic diversity decline. Government and the market completely destroy languages, eliminate them and annul the vernacular and creativity of language; they are the promoters of the global unification projected by capital, which organizes the current war and can condemn us to blindness and silence. Some 5,000 languages still exist in the world. One hundred of them are distributed in 95 percent of the global population, the rest, the immense majority, in the other 5 percent. Of the living languages, 30 percent are spoken in Asia and Africa, 20 percent in the Pacific Region, 16 percent on the American continent; only one percent is spoken in Europe, 67 languages. One of those living languages dies every week; a civilization dies with it, a way of being and thinking. Amoeba-words have invaded us. But maybe we shouldn’t associate this innocent transparent little animal, with fuzzy contours, with the verbal monstrosities that we suffer. The term “plastic words” is preferable, as the German linguist Uwe Porksen proposes. He has listed and characterized them with rigour. According to him, they are “the master key of daily life;” easily accessible, “they infiltrate entire fields of reality and re-order their own likeness.” They are words like identity, development, communication, information, solution, energy, or resource. They have an aura. Their definition has been lost or is entirely imprecise, but they are full connotations, generally positive. They are often born in the common language, emigrate to scientific dominion and are returned to their place of origin with enormous colonizing … and destructive force. “Development” is one of those words. It means almost anything, from building skyscrapers to installing latrines, the same as drilling oil wells that look for water. It’s a concept with monumental emptiness… that has dominated public discussion for more than half a century. In these years, it has been used systematically for packing all the works and actions that dispossess the peoples of their lands, their waters, their territories, and for disqualifying those who resist them: they are retrogrades, opponents of development and progress. “Energy” is the same. It’s seldom used with its vernacular meaning, which still appears in dictionaries, when one says that someone is very energetic for alluding to a vigorous and active person. The word is used daily for referring to themes like the cost of gasoline or renewable energy. If anyone asks us what energy is we’ll vacillate a little and confess technical ignorance, confident that the specialists will be able to give a good definition. When they inform us that it’s the mass multiplied by the square of the speed of light we are perplexed; we’re not talking about that. Helmholtz and others used its vernacular meaning for their investigations and when the word returned to daily language it produced a vacuum. We tell each other nothing by using them, but operate as signs of a sect. This is not an academic issue. We habitually suffer the consequences of this destruction of language that makes political discourse a faithful expression of Orwell’s neo-language. In his dystopia, peace is war, as Big Brother incessantly repeated. Like Goebbels did for Hitler. Procedure is an indispensable ingredient of the authoritarian exercise: it is its condition of existence. One cannot govern with bayonets; one can govern with words. In recent days, the promoters of the No in Colombia revealed the refined propaganda techniques that they used to get their proposition. In certain zones, they encouraged indignation; in others, the need for subsidies. In each one they were seeking to induce abstention or rejection. And they attained it. Procedure has ruled among us for a long time. Tomorrow the Senate is voting on an initiative that destroys the right to strike, but it is called labour justice. An authoritarian dispositive that has nothing to do with education is even named an education reform. Or an enormous lie is presented as “historic truth,” with which they attempt to cover up the Ayotzinapa crimes. The uses of neo-language in Colombia, for influencing the plebiscite, or what surrounds what is relative to Ayotzinapa, for uncovering the guilty and those responsible in the government and in the Army illustrate well what this operation is about. Against what and who we are fighting… and how language is also territory that we must defend faced with fulfilled threats of dispossession. They recalled that last September 23rd, Guzmán Álvaro came, together with a group of ejidatarios, to the area where the access to the waterfalls of Agua Azul is located, in order to evict those who confront his ideas, and that immediately after his arrival, the State Preventive police took over the headquarters of the Sexta in Bachajón. Just a week after this happened, Guzmán Álvaro and his supervisory board issued a communiqué designed to convince people that their struggle is for the defence of the land and demanding that the government recognize them as an authority, “but not explaining the background of their true intentions to hand over the lands to the bad government”, they said. In addition, on October 18th the officialist commissioner organised roadblocks in different parts of the ejido to ask for government intervention, ostensibly to solve internal problems, but actually to hand over their natural resources and ratify an agreement signed in 2011 to benefit transnational corporations. That same day, Domingo Pérez Álvaro, Tseltal member of the adherents to the Sexta from the ejido, was assaulted physically and subsequently arrested. Pérez Álvaro was attacked when he was returning to his home after visiting Santiago Moreno Pérez, indigenous political prisoner imprisoned since 2009 in Playas de Catazajá on false charges with which he was incriminated in order to remove him from his position on the board of autonomous vigilance. “This permanent presence of the bad government in our territory totally violates the rights of our people to autonomy and self-determination,” they said, and repudiated the “servile” attitude of the ejidal commissioner and the supervisory board that makes possible a policy of dispossession, through the support of civil human rights organizations, and the pretence that their movement is a struggle for the defence of the territory. Now, in addition to giving land to the government, he is committing violent acts against social activists. To the people of Mexico and the world. Compañer@s, people fighting for social justice and autonomous organisations, the women and men of San Sebastian Bachajón send you greetings. Today, the 20th of October, early in the morning, the ejido authorities of the Sexta Bachajón were again threatened. The leaders, including compañero Domingo Pérez Álvaro, the community’s human rights promoter, were threatened that they would be detained or kidnapped by the people from the ejido commission headed by C. Manuel Guzmán Álvaro. The news was delivered by third parties from the village of Xanil, members of Manuel Guzmán Álvaro’s ejido commission, who said that compañero Domingo Pérez Álvaro is first on the list of people to threaten followed by the rest of the authorities of the Sexta Bachajón. They also reported that 50% of the police were currently in the village of Xanil, in the home of C.Carlos Jiménez Gómez, whose two sons are state police; Carlos Jiménez Hernández and Rafael Jiménez Hernández, members of the state police who are also taking part in this harassment. We state that any detention or deprivation of freedom that occurs to the authorities of the sixth declaration of the ejido Bachajón will be the responsibility of the ejidal commissioner. This is exactly what they did to our compañero Emilio Jiménez Gómez, an adherent to the Sexta; they illegally detained him, and turned him over to the police, who invented crimes and then sent him to prison, and today he is a prisoner in Playas de Catazaja. As members of the ejido Sexta Bachajón we state clearly that we had nothing to do with the acts organised and committed by C. Manuel Guzmán Álvaro’s ejidal commission. These people threw trees in the road, they burned a municipal police patrol vehicle near Jolamaltzak on the Ocosingo-Palenque highway. These social disturbances were committed by the ejidal commissioner C. Manuel Guzmán Álvaro and his group, and used as a way to invite the intervention of the state authorities. This same day in the morning the principal of the ejido commission, C. Agustín Saragos Gómez, the agent of the El Paraiso community, C. Jerónimo Moreno Gómez, and a direct representative from the El Paraiso ejido commission, C. Manuel Jiménez Álvaro, threated our compañero Domingo Pérez Álvaro with death; this death threat was on the orders of the ejido commissioner C. Manuel Guzmán Álvaro, who told his collaborators that compañero Domingo Pérez Álvaro would be finished off as they had done to the late Juan Vázquez Guzmán, murdered 24th April 2013, for defending Mother Earth until the bad government sent its hitmen to kill our compañero. We make clear this threat against our compañeros, adherents to the Sexta and we hold C. Manuel Guzmán Álvaro and his people responsible for any detention, kidnapping and/or deprivation of liberty that may befall the Bachajón Sexta ejido authorities, including all members of this autonomous organisation. We will keep you informed of any incident or act committed by the ejido commissioner Manuel Guzmán Álvaro. Juan Vázquez Guzmán Lives, the Struggle for Bachajón continues! Juan Carlos Gómez Silvano Lives, the Struggle for Bachajón continues! Immediate return of our disappeared and murdered compañeros from the Teachers School – Normal Raúl Isidro Burgos de Ayotzinapa! Long live the Chol compañeros and compañeras from the Ejido Tila’s dignified struggle! Long live the compañeros and compañeras from San Francisco Xochicuautla’s dignified struggle! Long live communities that fight for autonomy and freedom! Translated by the UK Zapatista Translation Service. Compañeros and compañeras, members of the communications media present at this press conference, receive militant greetings from the adherents to the Sixth Declaration of the ejido San Sebastian Bachajón, and our thanks for accepting our invitation to this press conference in which we want to let you know the word of our organization about the latest developments of dispossession and violence in our territory, occasioned by the bad government and the officialist ejidal Commissioner Manuel Guzmán Álvaro. We share our outrage at the recent acts of the officialist ejidal Commissioner Manuel Guzmán Álvaro, elected at the General Assembly of ejidatarios on 18th April this year. Before the election he presented himself to our organization and we listened to him because we are pueblo and brothers and sisters and this is our custom and the way of working of our organization which is struggling and seeking for the unity of our people. This was how we heard the word of the then candidate for Commissioner, who at that time was speaking of wanting to struggle and to defend the land of the ejido; he said he was aware of how previous Comissioners had not respected the autonomy and rights of the people of San Sebastian Bachajón and said that he would defend the land and respect the organization of la Sexta. But so far he has not fulfilled and respected his word, because his actions are completely contrary to what he said. On 23rd September 2016 the officialist ejidal Commissioner C. Manuel Guzmán Álvaro entered the area of ejidal endowment where the access to the waterfalls of Agua Azul is located with a group of landowners, to evict the group of ejidatarios who were in a confrontation with them, concerning questions about the election of the Commissioner, led by CC. Manuel Jiménez Moreno, Juan Álvaro Moreno, Daniel Moreno Gómez, Carmen Aguilar and others who were claiming the access to the Agua Azul Waterfalls, located at the site of the headquarters of our organization, which was burned down on 21st March 2015. Immediately after the arrival of the Commissioner Manuel Guzmán Álvaro, the State Preventive Police took over our headquarters. denuncia pública” (http://chiapasdenuncia.blogspot.mx/2016/09/ejido-san-sabastian-bachajon-exige.html) ) trying to pretend that their struggle is for the defence of the land and demanding that the government recognise them as an authority, but not explaining the background of their true intentions to hand over the land to the bad government. On 18th October, 2016, the officialist commissioner organised roadblocks in different parts of the ejido to request the intervention of the bad government to supposedly resolve internal problems in the ejido, but actually designed to hand over our natural resources, to ratify the agreement made in 2011 and signed by Francisco Guzmán Jiménez alias Goyito with Juan Sabines Guerrero, all this for the future benefit of transnational corporations. On that day, people who are supporters of the Commissioner detained, beat and stole belongings from the compañero Domingo Pérez Álvaro. On 20th October, 2016, the authorities of the ejido la sexta Bachajón again received threats, these were threats of arrest or kidnapping by the people who are supporters of the officialist ejidal Commissioner Manuel Guzmán Álvaro. Members of the group of the ejidal commissioner Manuel Guzmán Álvaro said they have a list of those threatened from la Sexta Bachajón. They verbally warned our compañero Domingo Pérez Álvaro that they would finish him off, as they did to the compañero Juan Vázquez Guzmán, executed at his home on the night of 24th April, 2013. At the request and insistence of the ejidal Commissioner, the bad government gladly took the opportunity to send police troops to protect the area of Agua Azul, the police requested by the Commissioner changed places, 50% of them went to Xanil village, to the home of C. Carlos Jiménez Gómez, father of the two members of the state police: Carlos Jiménez Hernández y Rafael Jiménez Hernández, belonging to the state police, who are also involved in this harassment. The bad government celebrates again the police presence in the area of Agua Azul, all with the continual manipulation and co-optation of the ejidal authorities who have been bought. Here is the word of the bad government that you can consult directly on their website: http://www.icosochiapas.gob.mx/2016/10/21/gobierno-del-estado-restablece-orden-en-agua-azul/. This permanent presence of the bad government in our territory completely violates the rights of our people to autonomy and self-determination, which is why we repudiate the subservience of the Ejidal Commissioner and his Supervisory Board who continue to allow this policy of dispossession, obtaining the backing of civil human rights bodies and pretending that their movement is a struggle for the defence of territory when it is the opposite and also intends to hand over the land to the government, and commit violent acts against social activists. We clarify as members of la Sexta Ejido Bachajón, that we deny all connection with all acts committed and organized by the officialist ejidal Commissioner Manuel Guzmán Álvaro towards civil society, because they have put trees onto the roads and have burned a patrol of the municipal police at the height of jolamaltzak, on the section of the road Ocosingo-Palenque, these acts were committed by the officialist ejidal Commissioner Manuel Guzmán Álvaro and his group, this was the manner in which they requested intervention from the state authorities; and we are making you aware that the sole responsibility for any detention and deprivation of liberty of the authorities and members of the sixth Declaration of the ejido Bachajón lies with the ejidal Commissioner Manuel Guzmán Álvaro. We thank for their national and international solidarity all the compañeros and compañeras who remain alert as to what happens in San Sebastián Bachajón. We salute and express our solidarity to the Yaqui Tribe who are going through difficult times in their struggle and resistance, which is also ours. From the northern state of Chiapas we send combative greetings from the women and men of San Sebastián Bachajón. Long live the communities that fight for autonomy and freedom! On this same date, Las Abejas also launched an invitation issued to commemorate the nineteenth anniversary of the Acteal Massacre framework in which they will hold a meeting to be held on December 21 and 22 this year in Acteal, Chenalho municipality. Following the attack on Domingo Pérez Álvaro, comrade and adherent from San Sebastíán de Bachajón. Today, 20th of October 2016, we read with anger and concern the third denunciation in three days by our comrades and adherents to the Sixth from the ejido of San Sebastián Bachajón. For three days they have faced aggressions, disproportionate police, military and paramilitary presence, and threats of eviction, imprisonment and death. Our comrades, the women and men of the Ejido of San Sebastián Bachajón have spent 11 years fighting for the defence of their territory, nature and the earth. They demand their right to enjoy and make use of their territory in the heart of the forest. The waterfalls of Agua Azul, which are in indigenous lands, are a treasure which is being kept for a choice few, as is the [hydroelectric] dam, about which there is financial speculation, which will benefit only the touristic elite. And which will “serve” equally few; those who can bear the moral and financial cost of staying in the luxury rooms of their hotels and playing on the golf course they want to build on the back of the blood, livelihoods, dispossession and displacement of those who are not disposed to bow their heads in the face of death and contempt for their life and history. In these years of fighting and resistance, against dispossession and the eco-tourism project of the Palenque tourist trail, they have had to overcome the death of two comrades and now the imprisonment of another three members of the ejido, as well as continual repression, day after day. We have in front of us the latest denunciations by the women and men, adherents of San Sebastián de Bachajón, about the bad governance of the ejidal commisioner Manuel Guzmán Álvaro, his direct collaboration in the provoking clashes and authorising the entry and installation of Preventative State Police and paramilitaries to halt the process of autonomy by the women and men, comrades of Bachajón. On the 17th of October, said commissioner led a group of thugs who brutally assaulted our comrade Domingo Pérez Álvaro, leaving him gravely injured. Our comrade Domingo Pérez was violently set upon by said group on his return from visiting the political prisoners in Playas de Catazaja. This new aggression forms part of the terror strategies that the aforementioned official commissioner has imposed in order to dispossess the people of these lands and hand them over to the economic interests of big business. The official commisioner, MANUEL GUZMÁN ÁLVARO. The municipal president, FELIPE GUTIÉRREZ MIRANDA. The governor of the State of Chiapas, MANUEL VELASCO COELLO. And above all, the president of Mexico, ENRIQUE PEÑA NIETO, all of them puppets in the hands of corporate interests, and perpetrators of a politics of death and dispossession. From this part of the world we wish to express our total solidarity with the autonomy that is being built in San Sebastián de Bachajón, and with the comrades and adherents, women and men, who keep these natural spaces far out of reach of the greedy hands of criminal corporate interest. We hold them and all three levels of government responsible for the aforementioned and all further aggressions that may occur. From here we will remain vigilant to what is happening to our comrades, men and women of Bachajón and with dignified rage we cry out to this bad, criminal government, NO MORE AGGRESSIONS IN BACHAJÓN! Juan Vázquez Guzmán lives, the fight in Bachajón continues! Juan Carlos Gómez Silvano lives, the fight in Bachajón continues! Immediate freedom for our imprisoned comrades from San Sebastián Bachajón! Les trois passants, Toulouse, Francia. As the originary peoples who make up the National Indigenous Congress and the Zapatista communities, we send our simple words in solidarity with the Yaqui Tribe, its traditional government, and its troops. We are with you in these difficult moments after the confrontations this past October 21 in Lomas de Bácum. We condemn the conflict and discord that are planted and promoted in the communities by the bad governments and their overseers, national and international corporations, who want to take control over the gas, water, and minerals of the Yaqui territory. To this end, the powerful sow division as a tool to impose death and destruction in our territories. For them, we are merely a path to more power and more money. As the peoples, nations, and tribes of the National Indigenous Congress and the Zapatista peoples, we salute the Yaqui Tribe’s defense of their territory. We call for unity in the face of a common enemy which aims to take everything that we as peoples have and which makes possible our collective organization, our history, our language, and our life. In the various geographies of resistance of the originary peoples of this country, the bad governments are using our own people to generate violence among us in order to guarantee their ability to impose extractive projects of death, structural reforms, the destruction of communitarian organization, and terror among those who struggle. For those who struggle, in contrast to the capitalists, the life and future of the people is everything. We call on national and international civil society, on the originary peoples, on the national and international Sixth, and on the free media to be attentive and demand the respect deserved by the indigenous peoples in their autonomous organization and self-determination. We energetically denounce the fierce aggression against Domingo Pérez Alvaro, indigenous Tseltal, ejidatario and adherent to the Sixth Declaration of the Lacandon Jungle from the ejido San Sebastián Bachajón, which took place on Monday, October 17th, at approximately 4 pm, at the top of the crossroads of Alan Sajcun in the territory of the ejido. According to a statement from the ejidatarios, the aggressors are people belonging to the group of supporters of the officialist Ejidal Commissioner, who are government supporters and enemies of the struggle carried out by the ejidatarios for their land and territory, which the bad capitalist government wants to take away from them in order to build a luxury tourist resort. This group of supporters of the officialist Ejidal Commissioner of San Sebastian Bachajón, Manuel Guzman Alvaro, detained compañero Domingo Pérez Alvaro and physically attacked him with heavy blows so that today he is still in a very delicate state of health. The supporters of the Ejidal Commissioner accuse Domingo Pérez of taking part in collective works on the lands of the neighbouring community of Bolom Ajaw and of participating in La Sexta Bachajón. In fact, compañero Domingo Pérez Alvaro has participated since the founding of La Sexta Bachajón, he has walked in promoting human rights and participated in the National Indigenous Congress; he also took part in the 20th anniversary of the CNI. On the day of the attack, Domingo was returning from the prison of CERESO 17 in Playas de Catazaja, where he went to visit one of the political prisoners of Bachajón, Santiago Moreno Pérez, on behalf of the organization. Compas of good heart all around the world, we hereby ask for your solidarity with and support for La Sexta Bachajón. Please denounce these acts and disseminate this information, because it is reported that the compañero is in a grave condition following this attack. We ask you to remain alert as to the situation in the ejido San Sebastián Bachajón. Compas of the ejido San Sebastián Bachajón, you are not alone! Yesterday, October 17th, our comrade Domingo Pérez Álvaro, a member of the Adherents to the Sixth from San Sebastián Bachajón, was stopped by a gang of thugs led by the official commissioner of San Sebastián Bachajón, Manuel Guzmán Álvaro. He was beaten up after having visited the political prisioners in Playas de Catazaja. Our comrade is seriously injured. Since May of this year, our comrades, women and men of San Sebastián Bachajón, have denounced the bad administration of the official commissioner, how his administration has collaborated in the destabilization of the area, provoking clashes with the partisans and accusing the men and women who are adherents to the Sixth of holding road blocks and other actions in which they have never participated. The official commissioner has also allowed the Preventative State Police to estabish itself in the area, in spite of promises not to allow its presence in Bachajón. It is clearly a strategy that intends to slow down the process of autonomy being undertaken by our comrades; this is the real threat to those on ‘top’, since we know the area’s juicy economic potential for ecological tourism and big hotel businesses. The dispossession strategy is also evident. Sadly, police repression, the incarceration of political prisoners and murders have accompanied the autonomous process of our comrades, women and men, of San Sebastián Bachajón. It pains us once more to hear the news of this attack on Domingo, our comrade Domingo. It fills us with indignation and anger towards those responsible: the official commissioner MANUEL GUZMÁN ÁLVARO, the municipal president of Chilón, the governor of the State of Chiapas MANUEL VELASCO COELLO, the president of Mexico ENRIQUE PEÑA NIETO, all of them puppets in the hands of corporate interests in the area, those interested in building a new Cancun in Agua Azul, with dispossession, repression and death. Let us remain vigilant, spread the word, demonstrate our solidarity with the Tzeltal dignity being constructed in San Sebastián Bachajón. STOP THE AGGRESSIONS IN BACHAJÓN! JUSTICE FOR OUR COMRADE DOMINGO! 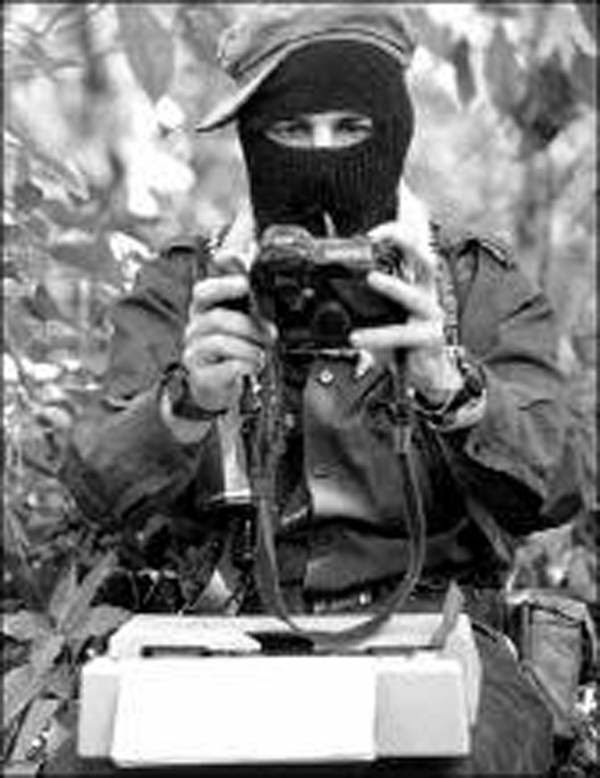 The Zapatista response appeared to reaffirm that their goal in presenting a candidate would be to expose the contradictions of the Mexican political system. Not long after the Zapatista National Liberation Army and the National Indigenous Congress resolved to present an Indigenous woman as an independent candidate for the 2018 presidential elections, the rebel group began to receive criticism. The decision made at the Fifth National Indigenous Congress caught many by surprise, as the Zapatistas had long rejected any formal participation in electoral politics. One of the first to respond was leftist former Mexico City Mayor Andres Manuel Lopez Obrador who suggested the EZLN, as the Zapatistas are also known, were trying to divide the left. Lopez Obrador is widely expected to run for president a third time in the upcoming election and an “independent candidate” could draw away votes that might otherwise go to him. In the 2006 election, Lopez Obrador lost in a disputed, though tightly contested, election. That year the Zapatistas organized “The Other Campaign,” which called on Mexicans to participate in political activity that went beyond voting. During “The Other Campaign,” Zapatistas — including the group’s most recognizable figure, Subcomandante Marcos — travelled throughout Mexico meeting with activists and social movement leaders in order to build a broad front against capitalism. In a letter posted online, Marcos, now known as Subcomandante Galeano, responded to the criticism. “How solid can the Mexican political system be, and how well-founded and reliable the tactics and strategies of the political parties, if, when someone says publicly that they are thinking about something, that they are going to ask their peers what they think of what they are thinking, the entire political party system becomes hysterical?” read the letter. When the decision to consider running a candidate was first announced by the Zapatistas, they specified that it was not being done as a means of securing power. “We confirm that our struggle is not for power, we do not seek it,” read the joint statement from the National Indigenous Congress and the Zapatistas. Galeano’s letter appeared to reaffirm that their goal in presenting a candidate would be to expose the contradictions of the Mexican political system. Referring to Margarita Zavala, the wife of ex-president Felipe Calderon and likely candidate for the presidency in 2018, Galeano presented a juxtaposition. “You who are reading this: would you be bothered by watching and listening to a debate between the Calderona (Zavala) from above, with her ‘traditional’ luxury brand clothing, and a woman below, of Indigenous blood, culture, language, and history? Would you be more interested in hearing what the Calderona promises or what the Indigenous woman proposes? Wouldn’t you want to see this clash of two worlds?” asked Galeano. The letter gave no indication the EZLN and the National Indigenous Congress intend to withdraw their proposal. The idea of running a candidate must still, however, be approved by the grassroots of the organization. From October 9 to 13, within the framework of the 20th anniversary of the founding of the National Indigenous Congress (CNI), the “Fifth National Indigenous Congress” was held at CIDECI-Unitierra in San Cristobal de Las Casas. About 500 delegates from 32 nations, peoples and indigenous tribes of Mexico, as well as members and support bases of the Zapatista Army of National Liberation (EZLN) and other guests participated. It worked in thematic working groups around the following themes: dispossession and repression; our resistances and rebellions; a review of the CNI; proposals for strengthening the CNI. On October 12, Columbus Day, a political-cultural event in Oventik Caracol was also held. On October 14, unjustly imprisoned Roberto Paciencia Cruz, Tsotsil indigenous, adherent to the Sixth Declaration of the Lacandon Jungle of the EZLN, held in CERESO No. 5 of San Cristobal de las Casas, Chiapas, again suffered unfair treatment. In a letter, he publicly denounced that the prison director, Jorge Antonio Utrilla Muñoa, along with his guard, Ernesto Guzman Lopez, denied entry to his visits “although the director had authorized permission the day before so they could go inside the prison”. Roberto reported threats and intimidation on the part of the prison director in order to deny the inmates their right of expression and to [make them] suffer in silence the ill-treatment both to prisoners and their visitors “[…] he tells us, if we complain to some dependency he can move us to another CERESO (sic.)”. It is the second time in less than two months that Roberto has been denied his “sacred visits” arbitrarily. In his letter, Roberto declares that, “the injustices, humiliations, threats, psychological torture, is the daily bread that the authorities give us in different jails of the state (sic.)”. It should be recalled that despite the numerous pieces of evidence of his innocence, more than three years after his detention Roberto Paciencia Cruz has still not had his sentence delivered, given that the prosecution has not presented [its case], although it has been called several times to testify before the judge.